Feast Day Celebration of St. John Paul II, the Great Mercy Pope! 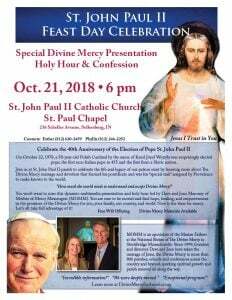 Celebrate the 40th anniversary of the election of Pope St. John Paul II with a special Divine Mercy presentation and holy hour with confessions available. On October 22, 1978, a 58-year-old Polish Cardinal by the name of Karol Józef Wojtyła was surprisingly elected pope, the first non-Italian pope in 455 years and the first from a Slavic nation. Join us at St. John Paul II parish to celebrate the life and legacy of our patron saint by learning more about The Divine Mercy message and devotion that formed his pontificate and was his “special task” assigned by Providence to make known to the world. You won’t want to miss this dynamic multimedia presentation and holy hour led by Dave and Joan Maroney of Mother of Mercy Messengers (MOMM). You are sure to be moved and find hope, healing, and empowerment in the promises of the Divine Mercy for you, your family, our country, and the world. Now is the time for mercy. Let’s all take full advantage of it! Two presentations will be given to the students at St. John Paul II Catholic School. One for elementary and one for Jr. High. Time to be announced. 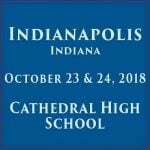 Divine Mercy materials will be available at the book table. MOMM is an apostolate of the Marian Fathers at the National Shrine of The Divine Mercy in Stockbridge, Massachusetts. Since 1999, Dave and Joan have taken the message of Jesus, the Divine Mercy to over 800 parishes, schools, and conferences across the country and beyond sparking spiritual growth and parish renewal all along the way. 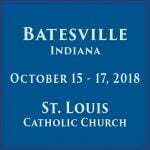 To invite MOMM to your parish, school, conference, retreat, or prayer group: Go to Invite Form. Click on the picture to download and print the flyer.